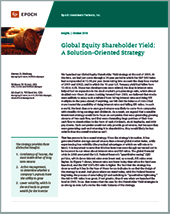 Global Equity Shareholder Yield: A Solution-Oriented Strategy - Epoch Investment Partners, Inc.
We launched our Global Equity Shareholder Yield strategy at the end of 2005. At the time, we had just come through a 25-year period in which the S&P 500 index had compounded at 12.5% per year (even taking into account the deep bear market of 2001 and 2002), and in which the 10-year U.S. Treasury yield had fallen from 12.4% to 4.4%. Those two developments were related; the drop in interest rates helped fuel an expansion in the stock market’s price/earnings ratio, which almost doubled over those 25 years. Looking forward from 2005, we believed that stocks were unlikely to enjoy such a tailwind from falling interest rates and rising P/E multiples in the years ahead; if anything, we felt that the balance of risks tilted more toward the possibility of rising interest rates and falling P/E ratios. In such a world, the best chance to earn good returns was likely to come from companies with steadily rising earnings and dividends. As a result, we argued that a sensible investment strategy would be to focus on companies that were generating growing streams of free cash flow, and that were channeling large portions of their free cash flow to shareholders in the form of cash dividends, stock buybacks, and debt pay downs. Such companies would not only provide good returns, but because they were generating cash and returning it to shareholders, they would likely be less volatile than the overall market as well. That has proven to be a sound strategy. 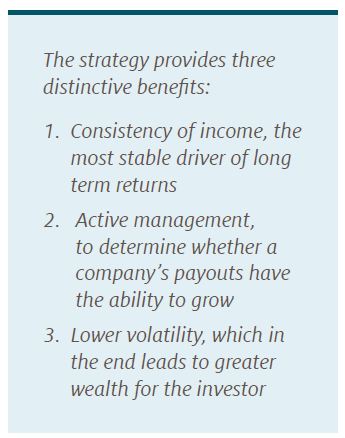 Since the strategy’s inception, it has generated better average annual returns than a broad global market index, while experiencing less volatility (the practical advantages of which we will return to later). It is important to note that this has been true even though we turned out to be incorrect in our views about interest rates and P/E ratios. The global financial crisis in 2008 prompted the U.S. Federal Reserve’s “quantitative easing” (QE) policies, which drove interest rates even lower and, as a result, P/E ratios even higher. 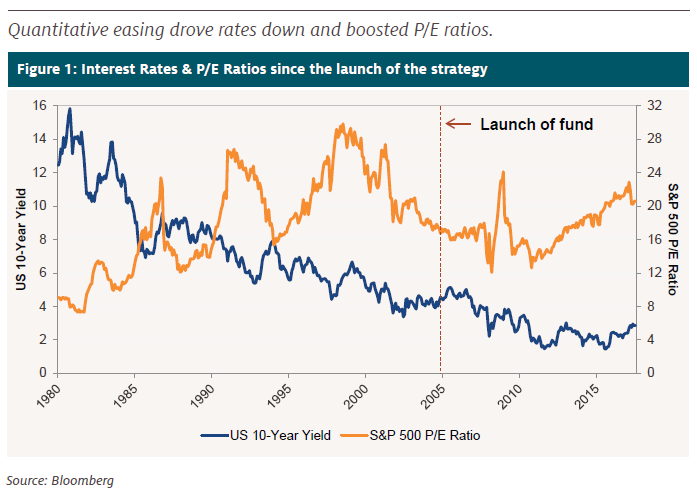 As Figure 1 shows, interest rates are lower today than when the fund was launched, and the S&P 500’s P/E ratio is higher. The fact that the strategy has done as well as it has in the face of those forces indicates to us that the design of the strategy is sound. And given where we stand today, with the Federal Reserve beginning the process of unwinding QE and switching to “quantitative tightening,” the risk to P/E ratios is as great, if not greater, than it was when we launched the fund in 2005. To us, that means that the case for the Shareholder Yield strategies is as strong as ever. Let’s review the main features of the strategy. Let’s examine each of these features in some detail. Descriptions of investment strategies can easily become lost in abstractions about annualized returns and standard deviations. Let’s keep this very practical. Why does anyone invest money? Simply put, people want to grow their wealth, and they hope to do so without having to suffer through any big losses along the way. Among publicly traded securities, stocks have historically been the best way to grow your wealth. There are two ways to make money when you own stocks: through dividends and through price increases. If you think of the price of a stock as its earnings times its price/earnings multiple, then you can break down any price changes into the product of the change in earnings times the change in the P/E multiple. Putting it all together, the money you make from owning stocks comes from three things: the dividends, the change in earnings, and the change in the P/E multiple. Figure 2 shows how the rolling 10-year return for the S&P 500 Index has broken down between those three components going back to the 1930s. You can see that dividends have been a positive contributor in every 10-year time period, and earnings have contributed positively in all but five of the eighty-two rolling 10-year periods. You may also note that the contribution from dividends seems to have decreased starting in the early 1990s. That is due to the fact that regulatory changes ten years earlier made share buybacks an attractive (and tax-efficient) alternative to cash dividends, and companies began to make increasing use of this additional method for returning cash to shareholders. Because buybacks reduce the outstanding share count, they tend to drive up earnings per share, so some of what used to show up in this analysis as the contribution of dividends has been transferred to the earnings contribution. In our minds, though, dividends and buybacks are equivalent, and constitute two of the three possible “shareholder yield” uses of free cash flow (the third being debt reduction). It is the change in the P/E multiple in Figure 2 that has constituted the biggest “swing factor” between when stocks have done particularly well (as they did in the 1980s and 1990s) and when they have done particularly poorly (as they did in the 1970s). Over the long term, these swings in P/E ratios have almost completely netted out, and the contribution of P/E changes to the cumulative return for the S&P 500 over 80 years has been less than 1% per year. 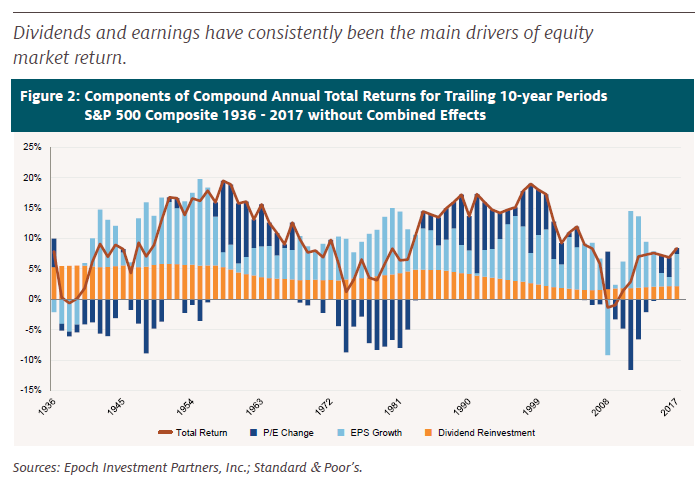 Dividends and earnings have driven the vast majority of the return on stocks. Today, we believe the outlook for earnings growth is relatively modest. Ultimately, earnings growth derives from, and in the long run approximates, nominal GDP growth. (If one grew faster than the other over the long term the profit share of GDP would move significantly higher or lower, but historically it has moved within a range of roughly 8% to 11%.) Nominal GDP consists of two components: so-called “real” GDP (i.e., what GDP would be if prices had not changed), and the inflation component. Real GDP can in turn be broken down into two components of its own. If you think of GDP as the total output that all workers produce, then growth comes either from having more people producing (i.e., growth in the labor force) or having each person produce more (i.e., productivity growth). Both of these components have decelerated to slower growth rates over the last ten years. Labor force growth has decelerated for demographic reasons: a slowdown in the birth rate, and the fact that the baby boomers have begun to retire. Productivity growth has slowed for reasons that are unclear, but whatever the reason, productivity growth over the last 10 years has been almost a full percentage point below its long term average. Slower workforce growth and low productivity growth have combined to cut the rate of real GDP growth from almost 3.5% in the period from 1950 to 2008 to just 1.6% over the last 10 years. Now throw in relatively low inflation – running at around a 2% annual rate in recent years—and nominal GDP growth has fallen to the lowest level in the data history that we have (going back to the late 1940s). This is not necessarily bad news for dividend growth. We live in a time when technology is helping companies to improve their return on equity, through a combination of higher profit margins (as technology is substituted for labor), greater asset utilization (as technology enables firms to generate more sales per dollar of assets), and higher leverage (as technology simultaneously allows firms to operate with fewer assets, which means they can return excess capital). All of these forces point toward companies being able to operate with less capital than was necessary in the past, meaning that firms will be able to return more of their cash flow to their shareholders—i.e., payout ratios should rise. In a world of low nominal GDP growth (which implies low earnings growth) combined with a trend toward “capital light” business models that enable companies to pay out more of their cash flow to the owners of the business, we believe that dividends will be the dominant driver of shareholder returns. And that is why the Global Equity Shareholder Yield strategy focuses on companies that have the ability to generate consistently high levels of dividends to shareholders, whether they take the form of cash dividends or share buybacks. The key word in that last sentence is “consistently.” Identifying the companies with the highest dividend yields is easy. Figuring out which ones will be able to sustain their dividends is another matter. A high dividend yield can sometimes be a sign of a company in distress. When a stock’s price falls, its yield rises, assuming the dividend hasn’t changed. So when a company encounters some sort of downturn, and its stock price falls, its yield will rise. But often the developments that led to the drop in the stock price will eventually force the company to cut its dividend, with a lag. After the stock prices of many major banks fell sharply in the fall of 2008, their dividend yields—based on their trailing 12 month dividends at that time – were extremely high. But of course, those dividends were unsustainable in the aftermath of the financial crisis, and most banks were forced to slash or even eliminate their dividends as time went on. Similarly, many energy stocks appeared to sport very high dividend yields in late 2014, because the sharp drop in the price of oil had driven their stock prices lower. But they, too, were forced to eventually cut their dividends, because the low price of oil meant they did not have the operating cash flow to sustain the previous level of those dividends. Figure 3 shows how common this phenomenon actually is. We went back to 1991 and looked at all of the stocks in the S&P 500 at the end of each year, sorting them by their dividend yield as of December 31st based on the dividends they paid over the preceding 12 months. We divided the stocks into two groups: the 50 stocks with the highest dividend yields, and all the rest. Then we looked at what happened to each company’s dividends over the subsequent 12 months. The graph shows what percentage of the stocks in each of the two groups ended up cutting their dividend payouts over the subsequent year. Over the 26 years shown, the percentage of companies in the S&P 500 that have cut their dividends from the previous year has ranged from a high of 18% in 2009 to a low of 2% (achieved twice, in 2011 and 2014). The average over the entire period for the index as a whole has been 7%. But for the companies in that top decile of dividend yield at the start of the year, the average has been 22% cutting their dividends (including a peak of 76% in 2009), versus 5% for the companies that were not in the top decile. 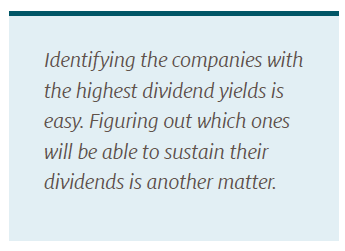 In other words, companies in the highest decile of dividend yields at the start of a year were more than four times more likely to cut their dividend than companies whose dividend yields put them in the other 9 deciles. 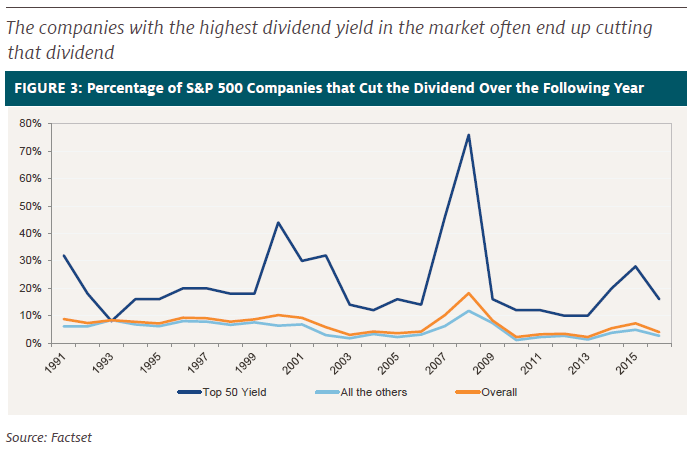 In addition, companies in that top yield decile have been less likely to raise their dividend in the following year. On average for the period shown in Figure 3, 47% of the companies in the top decile have raised their dividend the following year, versus 55% for companies in the other 9 deciles, and 54% for the index as a whole. So if you want to focus on companies that are paying high dividends, you need to pay a lot of attention to whether those dividends are sustainable, and on whether they can be increased. That’s where active management comes in. Our Global Equity Shareholder Yield portfolio management team focuses on understanding the drivers of a company’s cash flow, and assessing whether the firm’s business model will generate the cash flow needed not just to maintain the current level of dividends and buybacks, but to raise those payouts in the future. In other words, we don’t want to own companies who have no growth opportunities, and are simply milking their slowly dying business by paying out high dividends. Ultimately, those dividends will decline. We want companies that are still growing, and which will be able to raise the level of their payouts to shareholders. Historically, stocks in our portfolio have experienced extremely few dividend cuts, and have raised their payouts at a higher than average rate. One of the unintended consequences of our focus on companies that are paying out high levels of dividends is that the stocks we own tend to experience less volatility than the market. Because the total return that our companies generate over time is more “front loaded” than that of the average company, there is less uncertainty around it, and the price movements over time reflect that lower uncertainty. On top of that, our portfolio construction process, with its focus on diversifying the sources of return and making sure that no individual stock contributes a disproportionate share of the portfolio’s dividend yield or cash flow growth, also helps to lower the portfolio’s volatility. Managers often talk about volatility, but they don’t often explain why low volatility in a stock portfolio is a good thing. Why should an investor care about low volatility? Isn’t return ultimately what matters, regardless of how you get there? It turns out that low volatility can mean greater wealth for you over time. That is, how you get there actually does affect where you end up going. 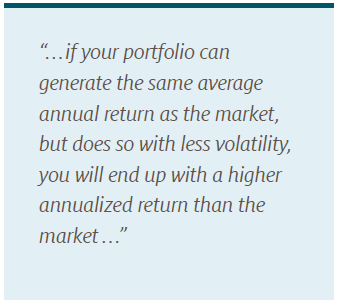 The lesson is that if your portfolio can generate the same average annual return as the market, but does so with less volatility, you will end up with a higher annualized return than the market – i.e., you will have more money than if you simply matched the index return each year. Low volatility is more than just a theoretical talking point; it is a very tangible benefit. As we noted at the outset, investment managers often talk about investing as if it is an abstract, purely intellectual exercise. But it’s not – it’s a very real attempt to grow your wealth. The Global Equity Shareholder Yield strategy takes the approach that the best solution to the question “how can I grow my assets?” is to focus on the most stable driver of equity returns: actual payouts to shareholders, either in the form of cash dividends or stock buybacks. We build our portfolio with a conscious goal in mind. Over time, we seek to achieve an average annual return of 9%, with two thirds of that (6%) coming from payouts to shareholders (primarily dividends and share buybacks), and one third (3%) coming from the underlying cash flow growth of the companies we hold. (If changes in valuation multiples net roughly to zero over the long term, this would translate into 3% price appreciation.) To make sure the payouts are sustainable, we actively manage the portfolio, seeking to eliminate those companies whose current high payouts are likely to be cut. And by focusing on companies that are returning capital to shareholders “up front,” we end up with a portfolio that experiences less extreme swings on the upside and the downside. Thanks to the effects of compounding, that lower volatility helps you build greater wealth over time. Over the short to intermediate term, our results may look quite different than the market, as investors’ enthusiasm for the latest “new new thing” waxes or wanes. But the market as a whole is not a consciously designed solution to anything – it is simply a collection of whatever companies happen to be public. Investing in an index is just a way to get “exposure.” Investing in the Global Equity Shareholder Yield strategy is a way to get something more: a well-designed plan for growing your wealth.